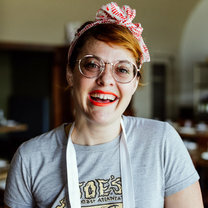 Born and raised in San Diego, Brittany Cassidy grew up in a large family of home cooks. She started training as a dancer at ten, and pursued the art during her young adulthood. Discovering a love for cooking while dancing professionally for Emmy award-winning choreographer Tessandra Chavez’s Unity Dance Ensemble for six and a half years, Cassidy often catered intermissions during show performances. A friend finally suggested she go to culinary school, and she enrolled in Hollywood’s Le Cordon Bleu, graduating in 2008. Under the guidance of Matt Carpenter, her mentor and first Le Cordon Bleu instructor, she began as a line cook under him at Josie, followed by Momed. In 2011, she worked at both The Hollywood Roosevelt’s Public Kitchen and Bar as a line cook, and at .ink as a morning prep cook. 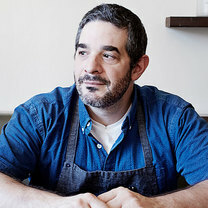 In 2013, award-winning Executive Chef Jeremy Fox brought Cassidy on as a line cook at Santa Monica’s Rustic Canyon, and she eventually worked her way up to Chef de Cuisine in 2015, running day-to-day operations for the acclaimed, ultra-seasonal restaurant. 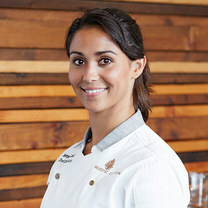 At Rustic Canyon, Cassidy has honed her skills in managing a successful kitchen and creating a cohesive team. Additionally, Fox has taught her the valuable lesson of what it really means to be a mentor, providing her with the tools to teach and guide her fellow cooks’ growth. Cassidy lives in Santa Monica, and in her spare time, she stills enjoys taking dance classes to keep her mind and body centered. "Wishing I had this in front of me right now. I finished that bad boy! halva soft serve sundae with hot fudge & salted peanuts from @tuskpdx #becauseitsalegume"
"Citrus Curd Tart Test. Usual suspects of California beauties Cara Cara, Blood Orange, Mandarinquats, Olive Oil, Pistachio and Love. #flourambassador"
sweetbreads roasted in cast iron with tallow, no poaching. "sweetbreads roasted in cast iron with tallow, no poaching. besides frying, how do you like them most?" "‘nduja toast & salted cabbage #monochromecanyon"
grass-fed beef carpaccio, squash, tenerelli orchards asian pear, benne seeds & aged shoyu-pumpkin seed vinaigrette. "BEFORE AND AFTER. grass-fed beef carpaccio, @whennguyenwhen"
"Every year my mother made me a strawberry cake for my birthday. I had a theory that if everyone didn’t eat a slice, I couldn’t get older. So on my birthday I made this Einkorn Strawberry Rose Ricotta Shortcake for YOU, dessert special tonight @#einkorn"